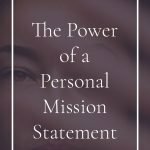 The power of a personal mission statement is that it provides a ruler against which you can measure all your other goals and activities. A personal mission statement helps you remember what your life is supposed to be about. The best statement will incorporate multiple aspects of your life including your physical, mental, spiritual, emotional, economic, professional, and social desires. Sometimes we are not sure what our real purpose here is and we use the process of elimination to figure it out out. This statement will help you realize when you have gotten it right. What is the purpose of my life? What am I here to be and do? What things do I stand for? What are my core values? Which of these values am I NEVER willing to compromise for ANY reason? What kind of person am I when nobody is looking? What do I really want to contribute to the world? Why have I been blessed with this life? Who do I love? How can I prove it on an ongoing basis? How do I want to earn a living? What kind of value do I want to add? How do I intend to increase my personal fulfillment? How can I live my best life consistently? The answers to these questions can become the pillars in the foundation of your own personal mission statement. In fact, it can be both cathartic and validating to invest time examining your beliefs, values, and strengths. This kind of self-reflection also helps you set goals and know that these goals won’t conflict with who you are as a person. This will enable you to enjoy maximum satisfaction, joy, and effectiveness. Can I offer a couple of suggestions for your statement? Don’t forget to consider how well you take care of yourself physically. Good health influences good feelings and greater positive personal interactions. Take the time to develop a few strong, meaningful relationships. Don’t forget to read a book every now and then–reading IS fundamental. Continuously feeding your mind will expand your understanding, as well as your opportunities. And give of yourself. This is essential for spiritual fulfillment. I am working on my own personal mission statement and enthusiastically invite you to develop one of your own. A thoughtfully prepared mission statement will serve as a guide to keep your thoughts and actions in tune with your deepest self. Your decision-making will be purposeful, intentional, and bold. It is my sincerest wish that you take good care of yourself. Fulfillment, happiness, connection, productivity, creativity, exceptional health, meaningful contribution, and the deepest love are all available to you. I hope you experience all of these wonderful things consistently and often. Your personal mission statement is a great place to begin. What do you think? Do you have a mission statement? How did you develop it? I hope you are planning a POWERFUL week! Previous Post: « Affirmation: My home is a complaint-free environment. Allegra, that was a perfect post! I think personal mission statements are so important. I’ve always had one, but have sometimes gone months without referencing it and I notice it makes a big difference. I personally need it in my face as a daily reminder to stay on track with my goals even when times are tough. I like your reminder how taking care of yourself physically is very important. As an entrepreneur I often forget everything but my work, but you are so right that everything is interconnected and one area going askew throws all the entire balance in all aspects of you life! Thanks! Have you made a change to where you keep your mission statement so that you see it more often? I’d love to hear your tip. I like your mission statement Allegra. It’s a great list to go by. Knowing why you’ve been blessed and the people you love is the foundation of life. Those are my favorites. It makes everything else have a purpose and a meaning to bring what you can to others. I also like your suggestion to read a book everyday. Being on the go all the time I personally like to use podcasts on my cell phone. I never knew how much you can learn nowadays to expand your mind and give to others. Great advice on how to maximize a personal mission statement. Thanks Allegra. Lovely message Allegra. I’ve read about creating a personal mission statement but the one’s I’ve seen have all been pretty vague and flowery so haven’t been motivated to take action I guess. I do have a couple of mantras that I hold dear to me and that basically encompass my philosophy on life. 1) Challenge assumptions, practice empathy and seek to understand. And 2) Live boldly, take risks, make somebody say, where the hell did THAT come from?! Thanks for the inspiration. Thanks for posting this!!! I have copied the questions and will sit down and make a mission statement. I have heard of doing this before, was never sure quite how to. I know basically what it is, just never wrote it down. I know the power of writing things down. Have to chuckle- Your suggestion – Don’t forget to consider how well you take of yourself. 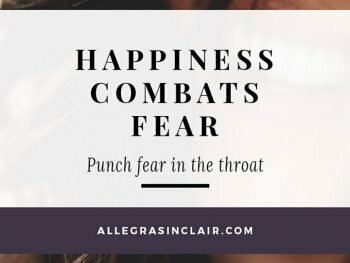 Even though one of my personal slogans is “balance is the key” and my father’s was “all things in moderation” — it is so easy to get caught up in projects, in the immediate, or in other people’s emergencies. As in no exercise at all for days on end as just one example. I guess that’s your point. Not just have a mission statement, but use it to keep on track, in balance, and under-whelmed. 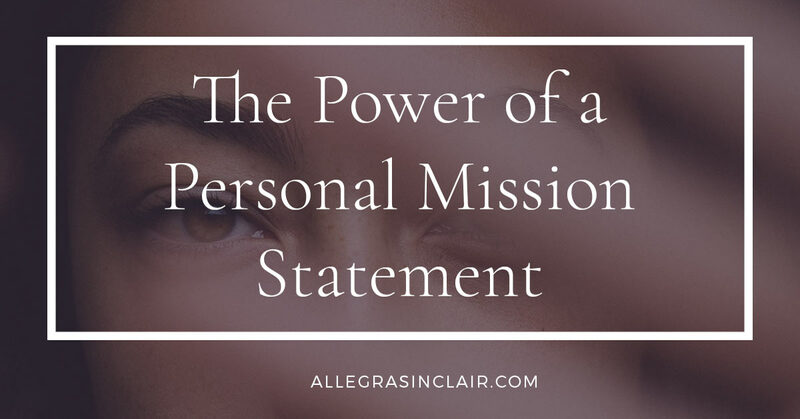 Allegra, I’ve always found my personal mission statement to be a critical part of living a life of energy and significance. There are a few great books out there on the subject. 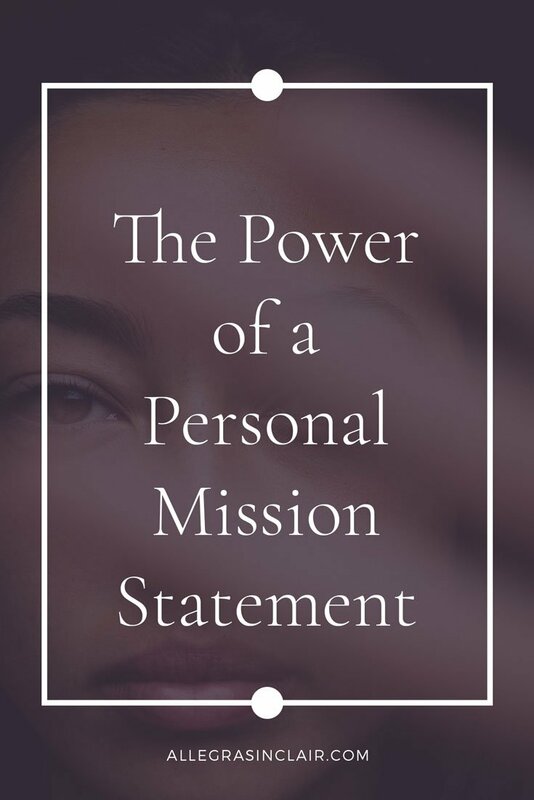 This next year, after reviewing and refining my own personal mission statement, I want to go through each of my business blogs and define their “personal mission statements” so that I can be even more focused in the value I deliver to my readers. 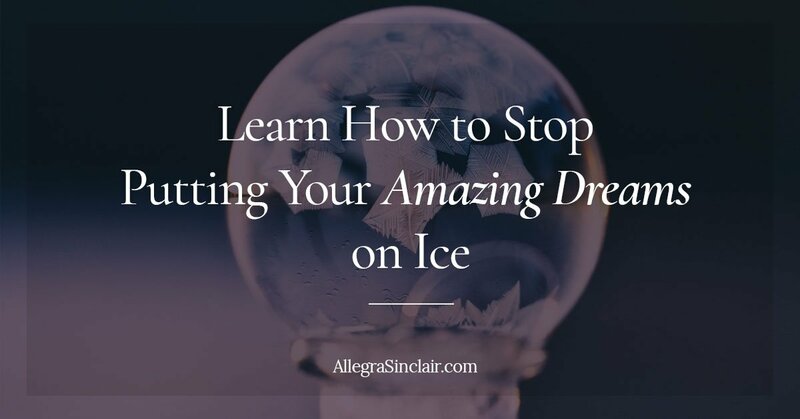 Allegra, you always have words of wisdom, but this post is awesome. It takes people into their personal journey. You always have to keep a check on yourself…always! As we grow, we learn and change. That’s a good thing, because stagnation stinks! The questions you raise makes people take a deeper look at themselves. This is so important in the journey of life. It applies to success, spirituality, interpersonal relationships, every aspect. If one doesn’t do this, they can become frustrated or unclear and waste time going down the wrong paths in life. BRAVO Allegra! I love this post! Blessings to you! Aw shucks, can you see me blushing? Thanks for your kindness. I really appreciate it!